The Statue of Liberty is a very unusual and unique sculpture. First, she is a FULL ROUND sculpture—a freestanding statue, sculpted all the way around. Her bronze (copper mixed with tin) “skin” is RELIEF SCULPTURE. The repoussé (reh pooh say) sculpting method of hammering the metal into wooden molds created the raised FORMS of her nose, eyes, lips, hair and the folds of her robe. She is as tall as a ten-story building—fifteen stories if you count her pedestal. An iron frame originally supported Liberty but during her more recent renovation (1984-1986), for her 100th birthday, the iron frame was replaced with a stainless steel frame. Liberty was a gift to America from France, celebrating the mutual freedom citizens from each of these countries mutually share. Liberty came to America in more than 300 pieces of hammered copper, which had to be pieced together and riveted in place. EMMA LAZARUS, a young Jewish immigrant, created the poem, The New Colossus, which gave words to the various feelings that this sculpture came to represent for the many immigrants whose first vision of America was this giant lady, who still stands on New York City’s shore. The poem, with vocabulary explanations, is included in the packet information and may enrich your classroom discussion about this famous American sculpture. The idea for Liberty came from Edouard de Laboulaye (La boo lay), a professor of law, in Paris, France. The idea that a monument be built in the United States “by united effort [as] if it were a common work of both nations,” came up at a dinner party in Laboulaye’s home in 1865. He wanted to honor the friendship between the United States and France since the days of the American Revolution. France had helped the struggling Americans win their independence from England. The two nations both cherished the same ideals—liberty and freedom. The idea excited Frédéric-Aguste Bartholdi (bar tol DEE), a sculptor, known in France for his monumental (very large) sculptures and he began sketches for the statue in 1869, using his mother as the model for the face of Liberty. Bartholdi was an expert sculptor. He knew how to make the huge statue but he did not know how to keep it from swaying and cracking in the strong winds of New York Harbor. For this, Bartholdi needed the help of an engineer. He went to his friend, Gustave Eiffel, who designed a frame to support the huge Statue. Eiffel was well known in France as a designer of bridges and he was the same man who later designed the famous “Eiffel Tower” in Paris. Eiffel designed the inside of Liberty with four giant iron columns, linked by crossbars that fastened to her copper “skin”. Liberty rested on this frame, allowing her to stand even in high winds. Lady Liberty was built in Paris. A small, 9-foot, clay model was made first. Then, a large 36-foot model showed workers how big each section of the statue should be at full size. Carpenters made a wooden skeleton and a plaster cast was formed over it. Big wooden forms were next fitted to the exact shape of the plaster. These wooden forms were then used as molds to shape the details on the copper “skin”. Big, flat sheets of copper were laid inside the wooden forms and hammered into the smooth curves and lines of the colossal statue. This hammering, called REPOUSSÉ (ree poo say), made Liberty strong, yet light in weight. In repoussé, hammering on the inside surface raises the outer surface of the metal. After the sheets were removed from the wooden molds, the copper was hammered on the outer side, to develop the detail that hammering on the inner side could not achieve. Liberty’s copper “skin” is very thin, less than the thickness of two pennies. 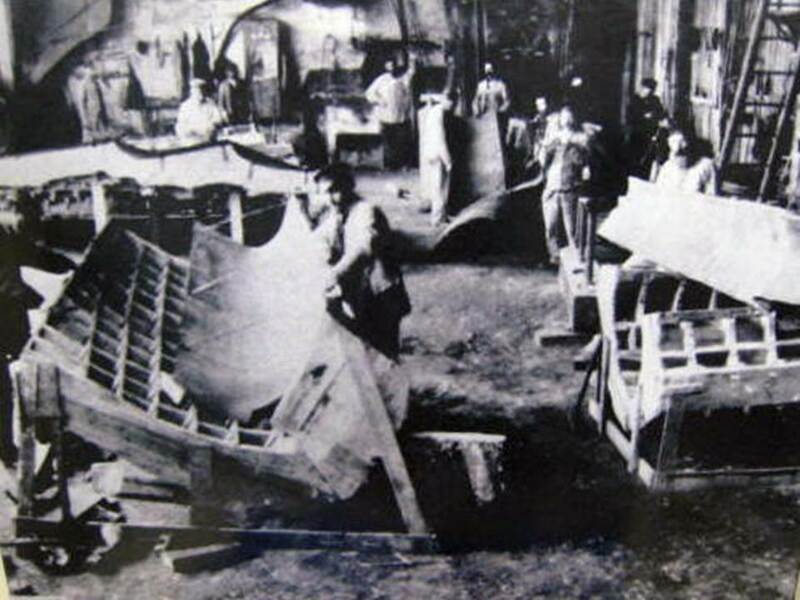 In the last stage of the creation of Miss Liberty, the completed copper pieces (over 350 in all) were taken outside the studio and assembled. Bartholdi needed to check and make sure all the pieces would fit together correctly when she arrived in America. Putting all the copper pieces together was very much like doing a giant jigsaw puzzle. The people of Paris watched Liberty as she was being built. 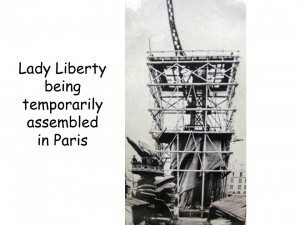 When she was completely assembled, Miss Liberty could be easily seen since she was so much taller than the other buildings of Paris. Liberty was then taken apart in pieces and packed into 214 specially built crates that were marked so she could be put together, piece-by-piece, on Bedloe Island in America. Miss Liberty arrived in New York harbor in June 1885. However, she had to wait for almost a year before she was reassembled because the pedestal she was to stand on was not finished yet! The people of Paris had raised the money to build Miss Liberty. The people of America were supposed to raise the money to create a pedestal for her to stand on. Americans were not doing very well in their fund raising efforts. Joseph Pulitzer, an immigrant who was publisher of the New York World newspaper, decided to help. He started a fundraising drive that quickly raised $100,000 from individual contributions. Pulitzer promised to publish the name of each contributor in his newspaper, no matter how small his or her donation. Contributions of .10, .25, and .50 cents were ordinary. True to its word, the New York World printed names—long lists of them—and the amounts people donated. 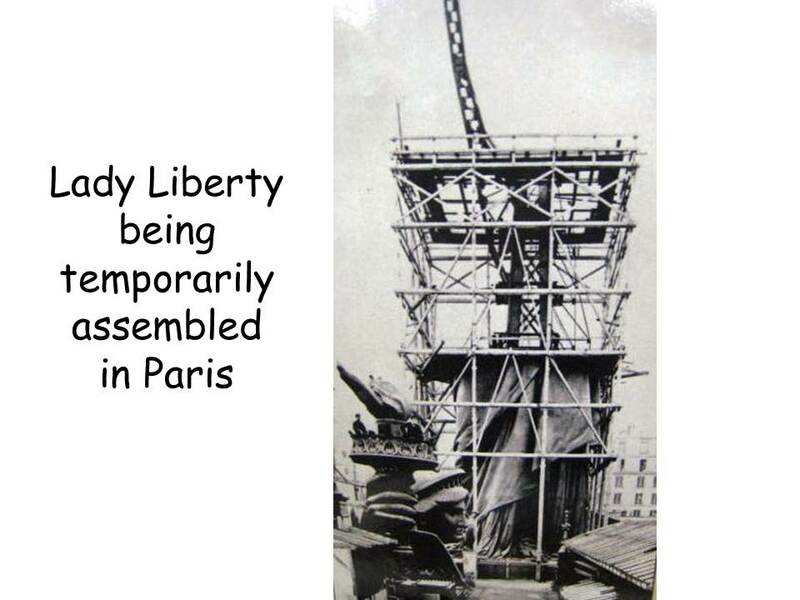 Richard Hunt, a famous American architect trained in Paris, designed Liberty’s pedestal. It was 89 feet tall and the last stone was set in 1886. The workers put coins from their pockets into the mortar of the last stone to symbolize all the small contributions, made by so many Americans, to help pay for the pedestal. Lady Liberty was finally finished and dedicated on October 28, 1886—twenty-one years after the idea was first discussed at Laboulaye’s dinner party. Laboulaye, one of the strongest French supporters of the project, died in 1893—just three years before Liberty was dedicated. Repoussé is a type of RELIEF SCULPTURE (RELIEF means to raise a surface). It is a term used to describe work produced by modeling (or shaping) sheet metal with hammer and punches. The surface of the metalwork is bent back and forth (raised or indented) to catch the light at different angles. The artistic process is derived from the French repousser, which means “to push against, to thrust back”. When referring to this type of artwork, repoussé has come to be used as a noun to describe a type of sculpture. The word REPOUSSÉ describes the part of the work that is done from the reverse side of the metal—pushing up the lines or patterns from the back. To create Liberty, large sheets of copper were laid inside wooden forms (or molds). These metal sheets were then hammered (from the back) into the raised curves and lines forming the folds of her robe, the shape of her body and her finer details (eyes, nose, fingernails, waves of hair, etc.). Repoussé is usually one piece of metal. In the case of the Statue of Liberty, there were more than 300 metal pieces, which were bolted together like a jigsaw puzzle. Liberty is the world’s biggest and most impressive example of repoussé sculpture. She is the largest, FULL ROUND, repoussé sculpture ever created! After the hammering on the back of the metal piece was finished, the artisans removed the metal from the wooden mold. The hammered copper was then turned over, so it could be hammered on the outer side. CHASING, or hammering from the front, was usually done to finish or touch up the last bit of fine detail, which hammering on the inner side could not achieve. Today, the term REPOUSSÉ has come to mean all RELIEF work done on metal, from either the back or front. Repoussé techniques date back to the Bronze Age. It is one of the oldest metalsmithing techniques in the world. Almost every ancient culture of the world has left examples of this art form behind. Items made of bronze were produced in Africa as early as 2500 BC and work was done in iron as early as 400 BC. Copper, gold and silver were also used for repoussé work. With these metals (and a variety of techniques), tools, weapons, jewelry and containers of all kinds were made. On a spring day in 1980, two men picked a strange place to camp out. They took their mountain climbing equipment and climbed partway up the outside of the Statue of Liberty. The men then ate dinner, spread out their sleeping bags on a fold of Liberty’s robe, and fell asleep. The next morning the men were fine. They hooked up their climbing equipment and repelled down Lady Liberty. Some people were not very happy about the two men camping on this important American Symbol. They were worried that the climbers’ equipment may have damaged Liberty, so it was decided that Liberty needed a complete inspection. The inspection discovered some surprising facts. The climber’s had not damaged the statue but time, weather, water and pollution had. 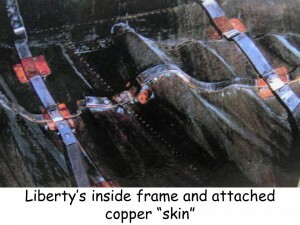 Liberty’s inside frame and outside “skin” needed major repair! Liberty then received a complete, inside and out, cleaning. The lighting, ventilation and elevator systems were all improved. Her iron framework was replaced with stainless steel and her copper “skin” was repaired. Liberty was given a brand new torch with a flame covered in real gold leaf. The repairs were finished just in time for Liberty’s 100th Birthday party. The cost to restore Liberty, and the island home she stands on was $86 million! That is more than 150 times the statue’s original cost! Every year, more than 2.5 million tourists visit the Statue of Liberty. 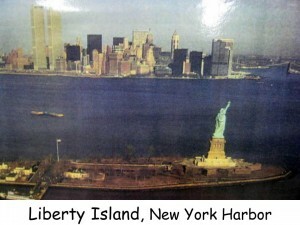 After New York City’s Twin Tower buildings were attacked, people were not allowed to visit Liberty for a while. Americans were worried that America’s symbol of Freedom might also become a target. The statue was finally reopened to the public. 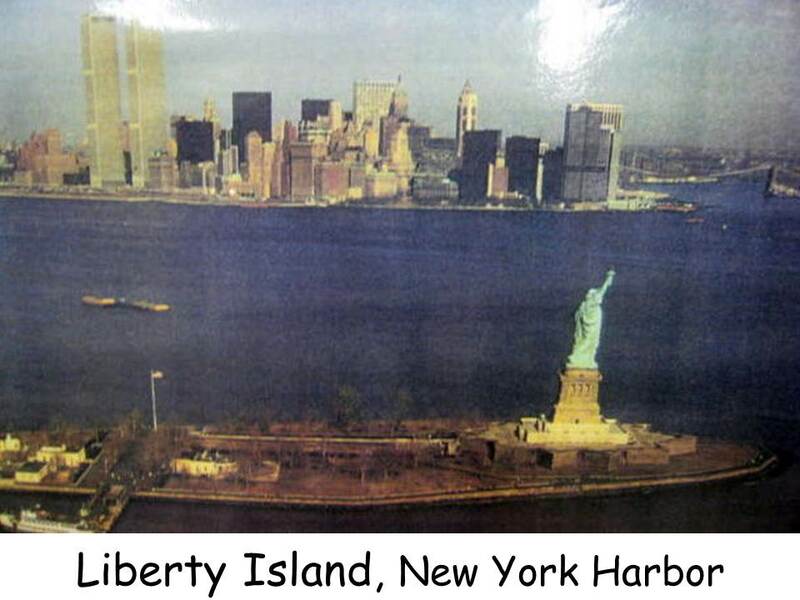 If you wanted to visit Liberty, you would need to take a 15-minute ferryboat ride to Liberty Island. The only way to get to Liberty Island is by using the Statue of Liberty – Ellis Island Ferry system. Private vessels are not allowed to dock at Liberty and Ellis Islands. If you were brave enough, you might climb all the way to the top of the statue. Visitors can take stairs or an elevator from the pedestal to the base of the statue. From this point on, your feet have to do all the work. *After 9/11, the government closed The Statue of Liberty for a time. It was eventually opened to the public again, but the viewing windows of the crown remained closed for safety and security reasons. Secretary of the Interior, Ken Salazar, announced in *May of 2009 that the viewing windows of Liberty’s crown would be opened again to visitors, beginning July 4, 2009. Access to the crown is now limited to 10 people at a time, guided by a National Park Service ranger. “We cannot eliminate all the risk of climbing to the crown, but we are taking steps to make it safer,” Salazar said. This includes raising the handrails on the spiral staircase and stationing rangers throughout the Statue to aid visitors, as well as help them enjoy the experience and learn more about the Statue and its symbolism. The Statue of Liberty will be open for the next two years. Then it will be closed again for work on a long-term solution that will improve safety and security permanently. In addition, the Department of the Interior will invest $25 million (under President Obama’s economic recovery plan) to stabilize the Baggage and Dormitory Building at Ellis Island, built in 1908 to house immigrants waiting for further processing, and repair 2,000 feet of the island’s crumbling seawall. Liberty is an amazing feat of sculpture and engineering. Bartholdi designed her as a monument to American independence. At her feet, he put a broken chain to show that the United States had broken free from England’s rule. In her left arm, she carries a tablet with the date of the Declaration of Independence written in Roman numerals—July 4, 1776. This is because the Declaration of Independence launched the great American experiment—the founding of a Republic where the people govern themselves. Bartholdi hoped the success of the American Republic would be an example for the rest of the world. He hoped that the American belief in individual human worth and dignity would spread across the seven seas to the seven continents. He symbolized this hope with Liberty’s seven-rayed crown and the burning torch that she holds high in her hand. Miss Liberty is 111 feet tall from her heel to the top of her head. Her height from pedestal to torch is 151 feet. Her index finger is eight feet long. She weighs almost 240 tons. For 13 years, Liberty was the tallest, modern structure in existence. She was born years before the modern skyscraper and was originally reddish-brown in color—like a copper penny. Over the years, the copper has oxidized and changed the statue to a pale green patina. During World War I, the United States War Department decided to make the torch shine brighter as a sign of hope for the millions of soldiers fighting in Europe. In 1916, hundreds of windows were cut in the torch’s flame and powerful lights were installed inside. The torch glowed more brightly but the new windows also leaked. Because of this, the iron ribs inside the torch and her right arm gradually rusted. By the 1970’s, the supports inside the torch were so weakened and damaged by rust that the torch seemed ready to break off. 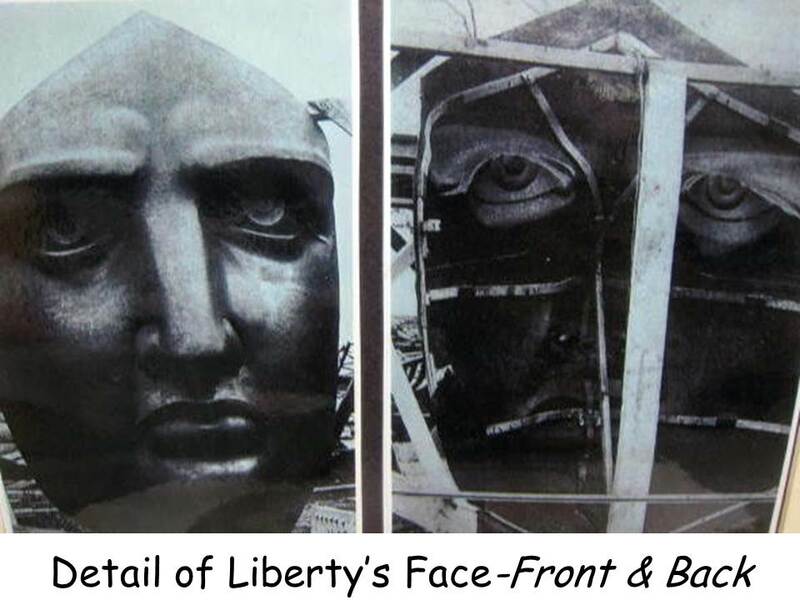 By the late 1970’s, Liberty’s shoulder needed major repairs. Liberty’s head had tilted until one point of her crown was threatening to poke a hole through the copper skin of her right arm. Over the years, the salty, polluted air of New York Harbor has eaten away at the outside of the statue. Liberty had suffered badly from corrosion. A chemical reaction between the iron rods of the supporting framework and the copper skin caused the rods to swell up and break off many of the rivets that held the copper skin to the iron framework. In a major restoration project of the 1980’s, EVERY iron rod of the supporting framework was replaced with stainless steel. Workers began repairs in 1984 and finished them in the early part of 1986, just in time for Miss Liberty’s 100th Birthday Party on July 3, 1986! For 12 million people, the immigrant experience began at Ellis Island. Ellis Island was America’s first federal immigration facility. The island is located about a half-mile north of Liberty Island, in New York Harbor. About 100 million living Americans (42 percent of our nation’s population) have ancestors who passed through Ellis Island, to get to America. • If you would like to learn more about American Immigration Escaping to America—a True Story, published by Harper Collins (2000) and written by Rosalyn Schanzer, is a wonderful picture book. The book’s illustrations are very detailed and the story is about the real grandparents of the author. The book tells about the immigration of a Jewish family, in 1921. It is a story of how these people were badly treated in their native Poland, just because of their faith. The details of riding in steerage, getting sick and uncomfortable on the voyage, are included in the story. Of course, the Statue of Liberty was the first thing the family saw as they entered New York Harbor! • Coming to American—the story of Immigration, published by Scholastic Inc. (1996) and written by Betsy Maestro is an excellent picture book about the process of Immigration. The book features information about the first person to step ashore at the new Ellis Island facility. Her name was Annie Moore, a 15 year-old girl from Ireland. • Journey to Ellis Island—How my Father Came to America, by Carol Bierman and published by Madison Press Books (1998), is another true story account. It tells of the ocean voyage and arrival at Ellis Island of eleven-year old Julius Weinstein who, along with his mother and younger sister, emigrated from Russia in 1022. Beautiful illustrations also include old time photos of Ellis Island and the immigration process. This is one of the very best of these picture books, although all books listed are highly recommended. • Watch the Stars Come Out, by Riki Livinson, published by E.P. Dutton of New York (1985), is a short and special story told by a grandmother to her granddaughter. The author says, “I wrote the story to hold onto one of the special times when I was a child—to hear the sound and feel the warmth of my mother telling me a story.” It tells about the long journey to America of a 10 year-old girl. She and her young brother traveled alone on a ship to join their Mama, Papa and little sister in America. Immigrant Kids by Russell Freedman, Published by Puffin Books, 1995; Ellis Island by Patricia Ryon Quiri, Published by Children’s Press, 1998; Immigration—A Library of Congress Book by Martin Sandler, Published by Harper Collins, 1995; Becoming a Citizen by Sarah Capua, Published by Children’s Press, 2002; The Statue of Liberty by Patricia Ryon Quiri, Published by Children’s Press, 1998. Lady Liberty is the largest bronze statue ever created. Bronze is made of copper, mixed with tin. Tin makes the soft, pliable copper stronger. The more pliable copper made it possible to create Liberty’s details using repoussé. The metal needed to fit the shape of the mold as it was hammered. Bring in a sheet of copper for the kids to see (check craft stores). 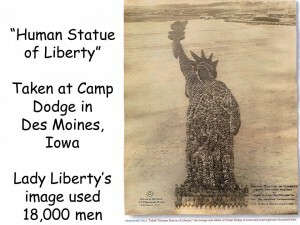 • Use one of the pictures of Miss Liberty for a pattern to create a repoussé design on aluminum foil. 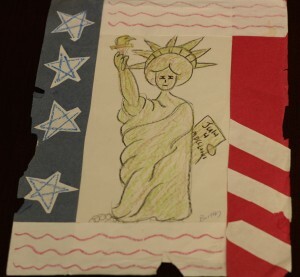 Kids can also draw their own simple line versions of Miss Liberty for this project. Lay a sheet of aluminum foil on top of a magazine (for padding). 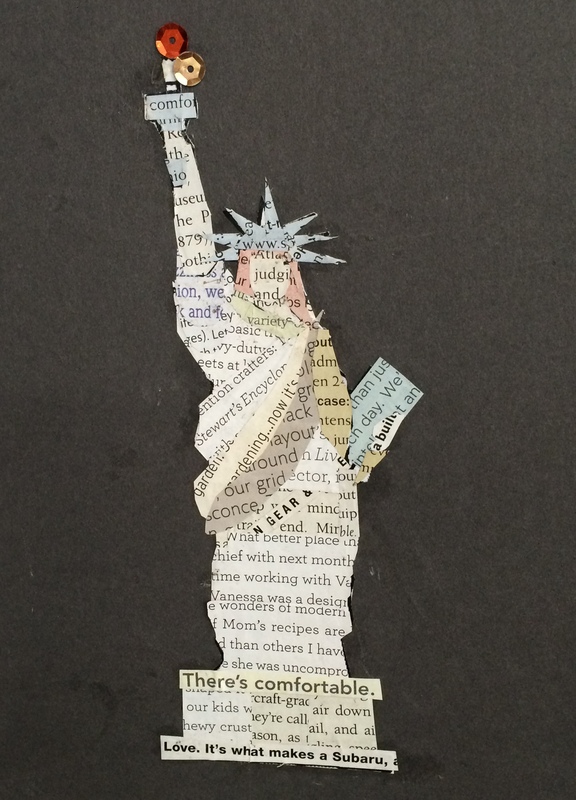 Tape a drawing of Miss Liberty to the foil with masking tape on the top and bottom so it does not move. Use a Ballpoint pen to trace over the lines of the drawing. After all the lines have been traced, remove the drawing from the foil. The design will be pressed into the foil. Tape the foil around a piece of tag board and mount on a larger piece of construction paper, to form a frame. If you use white construction paper, color the frame with red, white and blue stripes and foil star stickers. A contrasting black frame would make Miss Liberty show up well. • Sculpt a statue of Liberty from a large piece of foil (2’-3’). Sculpt her dress, head and upraised arm first. Don’t worry about the details, just her silhouette. Be sure the head is big enough to wear her rayed crown. A small piece of cardboard could be covered with foil to be her tablet. Foil can be crushed and shaped, just like clay. The draped part of Liberty’s gown could be added separately and glued or taped. • Use HEAVY-DUTY aluminum foil to create molded facemasks. This is a project for 5th graders, because the finished foil mask is easily crushed. Have kids work with a partner. Center the piece of foil on a person’s face and gently push, beginning with the nose, to wrap the foil around the face. Close eyes and carefully push around the brow and above the cheek. Keep lips together as the foil is pushed against them. Wrap foil under the chin and over the front of the forehead. These three-dimensional masks can be displayed by stapling or gluing them to construction paper. This last step will give masks a chance to make it home! • Create a paper mâché statue of liberty. She could be spray painted with copper or hand painted with a light green (like the patina color) TINT of tempera or acrylic paint. This type of project would take at least 2 class sessions to complete. Discuss the idea with the teacher, in advance, to make sure the time required for the project can be scheduled. It is not recommended doing more than ONE larger project like this during a school year, as some teachers won’t have the time. 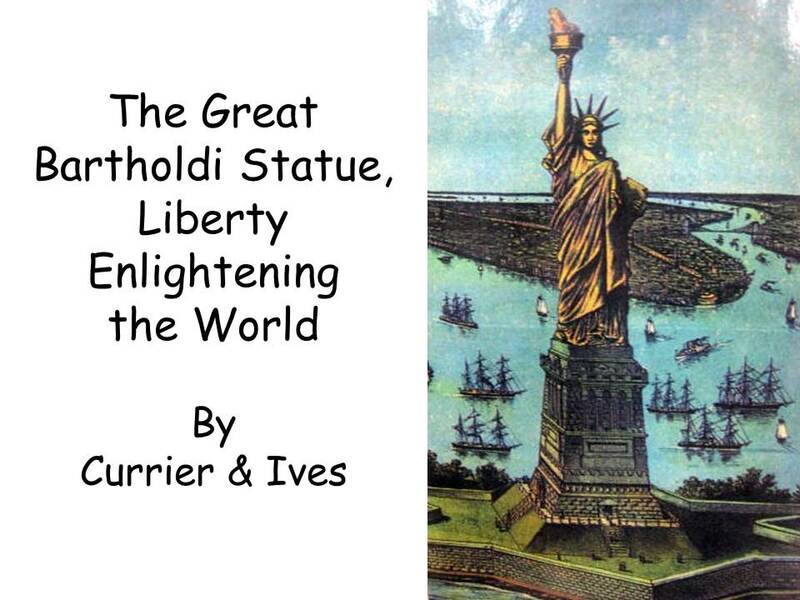 • Sculpt a clay version of the Statue of Liberty’s hand with her torch, or the entire statue. • Families were very important to early American immigrants, the ones they left behind and the ones they were with in this new country. Color or paint a large tree. Create a family tree from this by cutting circles and making the faces of the people in your own family. These portraits can be glued to the tree branches with the names of each family member written beneath. 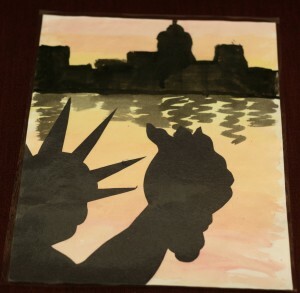 • (K-1) Create a Statue of Liberty face stick puppet using a small paper plate, foil and a craft stick. Cover 7 tag board triangles with foil and glue to her head. Draw a face in the center of the plate. Challenge kids to go home and teach mom and dad facts they learned about the statue! 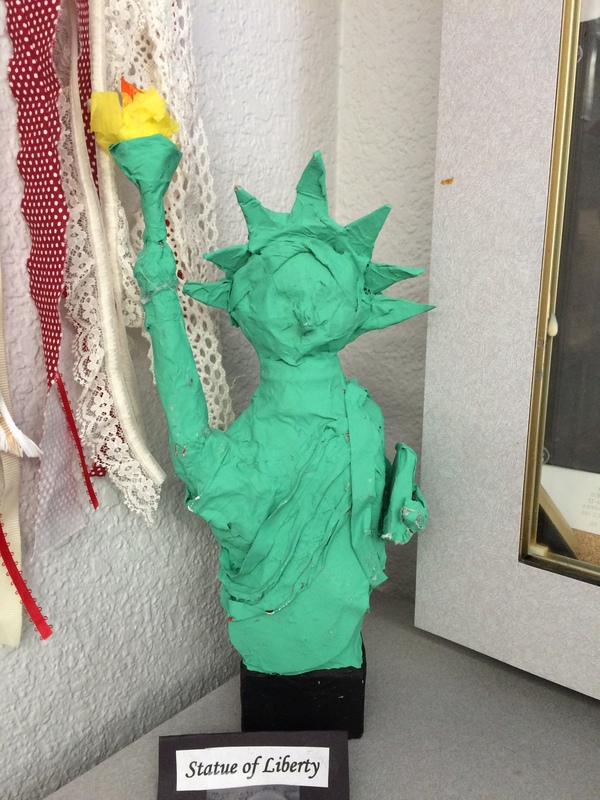 • (K-1) Create your own Statue of Liberty crown. Use inexpensive, plastic headbands and attach 7 cardboard triangles with duct tape. Cover everything with heavy-duty aluminum foil. 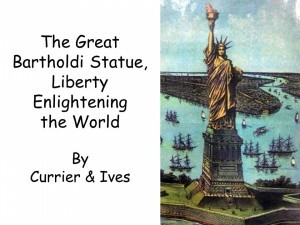 • Some of the feelings or MOODS that a statue like Liberty Enlightening the World might create for people could be patriotism, pride, beauty or understanding. Since the tragedy of September 11th, the Statue of Liberty may have come to mean more than it used to for some people. 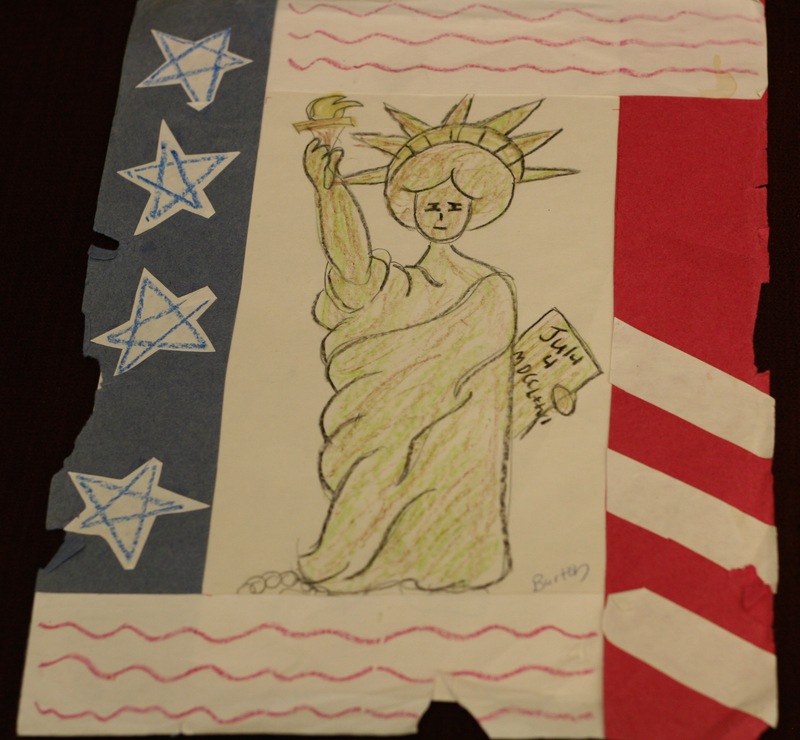 Challenge older kids to write about how they feel about being American citizens or living in the United States of America. • (Grade 4-5) Discuss the history of immigration in America. Help kids come up with sculpture ideas that say something about immigrants, immigration, freedom, and the hopes of all people for a bright future for themselves and their family. 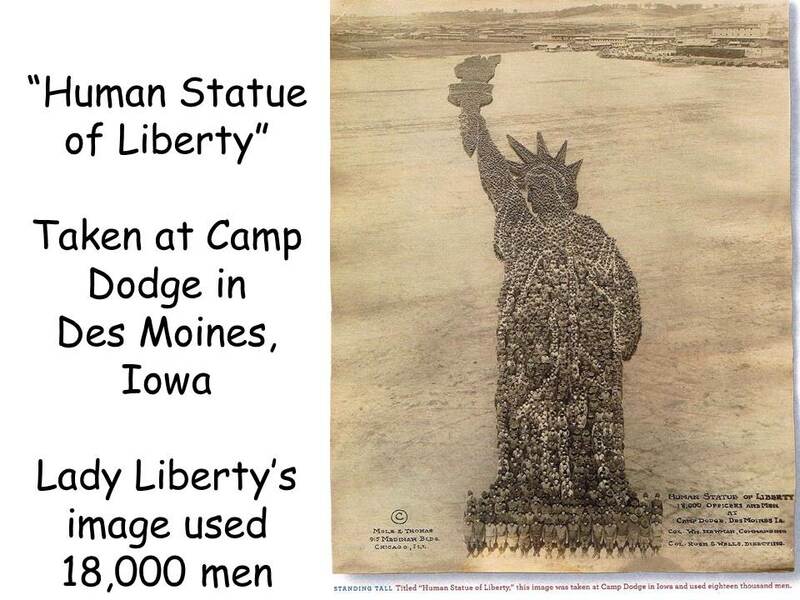 Be sure the class understands that their statues should not resemble Liberty. The sculptures should be an abstract or realistic visual SYMBOL of an idea, their own feeling about the freedom they have because they live in the United States. Discuss what types of three-dimensional symbols might represent words like FREEDOM, LIBERTY, CHOICE, SAFETY, SECURITY? Be sure kids understand that the sculptures should be a visual representation of an idea or feeling. Everyone should sculpt (or draw) their own visual representation of these ideas and give their artwork a meaningful title. Currier & Ives is the most famous American Firm of Lithographers. The work of this firm created a true pictorial record of American history and life in the later 19th century. The lithographs weren’t intended for this purpose though. They were created for a market of average people, who wanted to inexpensively decorate the walls of their homes, during the later half of the 1800’s. Although hundreds of other lithographic firms published prints during the same period, Currier & Ives prints were superior in quality and quantity. James Merritt Ives was born in New York City on March 5, 1824. He was an artist and created a lithography firm of his own. Currier hired Ives as a bookkeeper, in 1852, and made him a partner in 1857. Although she did not create this particular print, Fanny Palmer drew hundreds of other Currier & Ives prints. Fanny was an immigrant herself, who sailed past Lady Liberty, on her way to her new home in New York. She and her family came to New York as penniless immigrants from England. Fanny was a talented artist and soon found work with Currier and Ives. She started with only drawing backgrounds and landscapes for the firm. Eventually Fanny became one of Currier & Ives’ most printed artists. She worked for the firm for almost 30 years. This picture of Liberty is a lithographic print. A lithograph is a type of printing invented in the late 1700’s. First, a picture or design was drawn on a smooth stone with a special crayon. It was a simple Line Drawing. Then the stone was treated with a chemical that allowed the ink to stick only where the crayon was used. Finally, the surface was inked and the crayon design was printed on the paper. Instead of making only one original version of a picture, lithographers were able to make many copies, or prints, of the original drawing by using this inking process. Lithography was the first technique to offer inexpensive, almost unlimited prints in both black and white and later, color. Currier & Ives originally printed their lithographs using black ink. A team of artists individually painted each print so it would have color. These artists were never given individual credit and because they did not sign their work, their names are lost to history. All credit was given to the owners of the Lithography firm, Currier & Ives. The prints were then hand colored by many different artists. These artists never signed their creations so their names have been forgotten over time. Originally, Currier & Ives prints could be ordered from their catalogue in prices that ranged from eight cents to $3.50. Today, these original prints sell for thousands of dollars and copies of these originals are still being printed. Currier & Ives had teams of artists to hand paint these inexpensive lithograph prints, which were similar to a coloring book picture. The prints were popular during (and shortly after) the celebration of Liberty’s dedication, once she was finally fully assembled in New York City’s harbor. In what ways might New York harbor look different today than when this print was made? Modern ships look very different than these types of ships, which were typical of the time. The roughly sketched background appears very flat, with sparse buildings or roads, compared to the tall, closely spaced skyscrapers and busy streets that now cover New York City. Today, Liberty Island would have many more sight seers on any given day than the few pictured here. The torch flame is now gold. Bartholdi first had to decide what an abstract idea would look like. A sculpture about “Liberty” or “Freedom” involves a problem of imagination first. By their very nature, these concepts had no material shape or texture. To make the idea of Liberty or Freedom visible, the artist had to personify them, reduce them to a FORM recognizable to viewers. Some symbolic associations were already familiar to people. Courage was often pictured as a dying soldier; knowledge—a wise elder; virtue—a young, innocent maiden. What would an abstract word such as “Freedom” or “Liberty” look like? Another consideration was that the artist was not just picturing Liberty, but American Liberty. The sculptor had to conceptualize a visual definition to personify this intangible concept. No existing conventional figure of the time was appropriate. Bartholdi had years earlier first imagined America as a young man—proud and almost savage—his arms resting on a machine, a horn of plenty at his side, and the shattered idols of the past at his feet. The emphasis was upon power and material strength; and ample evidence of that vigor passed before the sculptor’s eyes as he toured America. However, those were not the qualities that Bartholdi wanted to stress with his sculpture of this American Liberty. The familiar European images of Liberty did not satisfy the sculptor either. He knew Delacroix’s famous painting of 1830 in which Liberty was a young woman, her clothes half torn away, leaping to the barricade over the bodies of fallen comrades. That personification of Liberty was too violent and did not match the country he had seen or his own ambition for Constitutional freedom. The picture of Columbia that commonly came to the minds of many Americans at the time was closer to Bartholdi’s idea, but not quite adequate. Originating from the lines of Joel Barlow’s epic tale and imprinted on the face of American coins; Columbia was portrayed as a Roman Goddess—mild-mannered, detached from man, offering no hint of passion or involvement. Bartholdi wanted more strength and passion for the Liberty of his sculpture. The statuette on the far right, which most nearly resembles the monument itself, includes both the familiar spiked crown and the tablet that was to be inscribed with the date July 4, 1776. “Liberty Island” was originally named “Bedloe’s Island”, until the name was officially changed on October 3, 1956. This photo was taken sometime during the early 1970’s; New York City is seen in the background. Notice the Twin Towers to the left. The photograph also predates Liberty’s 100 year make-over (repair), finished in 1986, when her torch was replaced with a metallic gold flame, which she now holds. The foundation that supports Liberty’s granite pedestal was created inside the star-shaped walls of the U.S. army’s old Fort Wood (which had been completed for the War of 1812), on the Fort’s original parade ground. The initial walls of the Fort had been designed in a multi-pointed star pattern. Inside the Fort, the parade ground was excavated, creating a hole that was over 17 feet deep. The digging went very slowly because there were some bombproof shelters and old stone wells below Fort Wood. These had to be broken up and cleared away in order to crate a firm foundation that would hold the colossal weight of the statue, along with the pedestal on which Liberty stood. Beginning at the bottom of the excavated hole of old Fort Wood, workers built a stepped pyramid of concrete. This concrete foundation was solid, except for a 27-foot square shaft in the center. It was the largest mass of concrete ever made up until that time. The concrete weighed more than 23,000 tons and was 65 feet high. Liberty’s eighty-nine foot pedestal was then placed on top of this concrete foundation. The pedestal was also made of concrete but the facing of the pedestal was covered with granite blocks. Richard Morris Hunt, the architect who designed the pedestal, originally designed it to be 114 feet tall. However, the American Committee, the fund-raisers for creating the pedestal, asked him to make a shorter pedestal design, in order to save money and finish it sooner. The committee preferred and agreed upon Hunt’s second pedestal design, although the intricate granite stonework made the second pedestal even more expensive. The only way to get to Liberty Island today is by using the Statue of Liberty – Ellis Island Ferry system. Private vessels are not allowed to dock at Liberty and Ellis Islands. 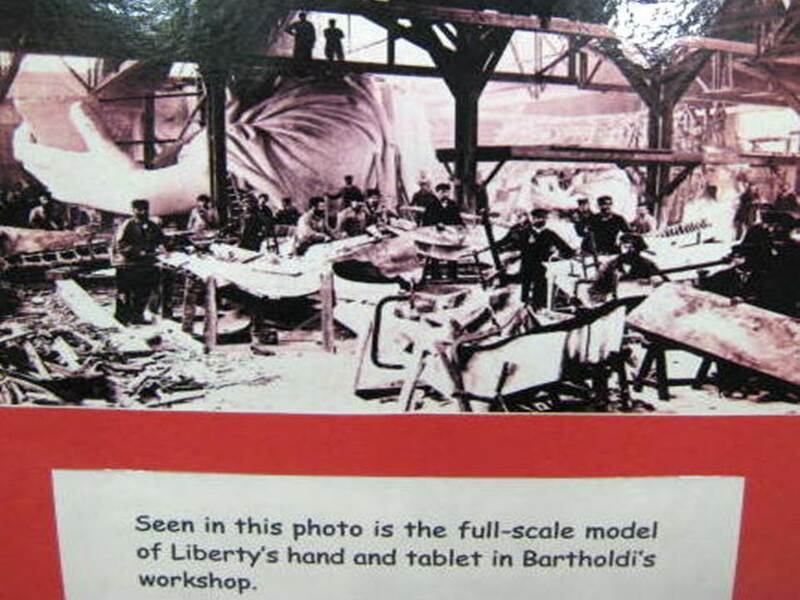 Fabricating Liberty was a very complex process involving many different artisans—sculptors, plasterers, carpenters and metal-smiths. Carpenters built a wooden skeleton of each section of Liberty. A plaster cast was formed and sculpted over this wooden skeleton, to show the three-dimensional folds of her sleeve and the FORM of her fingernails. In this photo, Bartholdi stands near Liberty’s wrist, next to a man in a top hat. 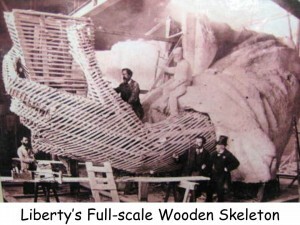 The full sized skeleton of Liberty’s left hand can be seen, made from wooden planks and dwarfing its creator, who is standing next to it. The plaster sculpture of the statue’s sleeve is complete and the next step will be covering and sculpting the wood frame of the wrist and hand in plaster. Wooden frame molds were then built up against the dried plaster sculpture, duplicating the exact FORM of each fold, bend, bump and curve. These many wooden molds resembled odd shaped bookcases with closely spaced shelves (Point out empty molds, which resemble bookcases, and can be seen in the left Middle Ground, in Background leaning against the plaster sleeve, and in Background on the far right). 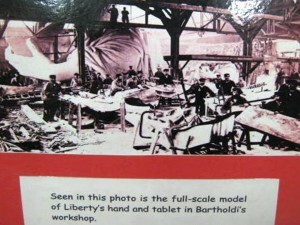 The complex task of scaling up Bartholdi’s first model involved a three-step conversion, the final stages of which can be seen here. The final sized version of Liberty’s left hand is shown on the left side of the background. Behind this, on the right side of the background, is the next smaller sized plaster version of Liberty’s hand. The smaller sized version of her finished plaster head can be seen beside this, on the farther right side of the background. This photograph shows a closer view of workers moving large copper sheets into the wooden molds, which were carefully shaped over the large plastered sections of the statue. Do you think some of these repoussé (ree poo say) molds resemble odd shaped bookcases turned on their side? The metal-smiths laid large, flat sheets of copper inside the wooden frame molds, then hammered and shaped these sheets of copper into the smooth curves and detailed lines of the statue. This hammering, called repoussé (ree-poo-say), made Liberty strong, yet light in weight. Liberty’s copper “skin” is very thin, less than the thickness of two pennies! Once the copper sheets were removed from the wooden molds, the copper was then hammered on the outer side, to develop the finer detail that hammering on the inner side could not accomplish. The copper sections (350 in all) were later riveted together like a giant jigsaw puzzle, into the large finished sculpture of Liberty Enlightening the World. In the last stage of the creation of Miss Liberty, the completed copper pieces (350 in all) were temporarily assembled outside Bartholdi’s Paris studio. The sculptor needed to check and be sure all the pieces would fit together correctly when the statue arrived in America, so he temporarily attached them to the iron frame. The people of Paris watched as Liberty was built. After she was completely put together, Miss Liberty could be easily seen, since she was much taller than the other buildings of Paris at the time. Can you see the buildings on the far left and right of the statue? Look closely at Liberty’s flame. Can you find the two men standing on the deck of the torch? This gives you a better idea of the size of Liberty compared to a human being. In America, a stairway led up to the torch and it was once opened to the public for viewing across New York’s harbor. Because this was not very safe, access to the torch has been closed since 1916. Since this time, the public was only allowed to view the harbor through the windows of Liberty’s crown, just above her head. Do you see these viewing windows in the photo? The Statue of Liberty is not standing still. A symbolic feature that people cannot see on the statue is the broken chain wrapped around Liberty’s feet. Protruding from the bottom of her robe, broken chains symbolize Liberty’s free forward MOVEMENT, enlightening the world with her torch, free from oppression and servitude. Point out the broken chain near Liberty’s foot (right FOREGROUND). 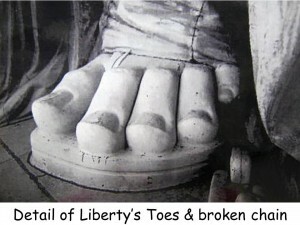 Bartholdi included a broken chain at Liberty’s feet to represent the freedom won by the American colonists, from England’s unjust rule, during the Revolutionary War. The broken chain also celebrates France’s assistance to America during the Revolutionary War, which aided America in winning her freedom from Britain. Can you see the detail of the folds created in the bottom edge of Liberty’s long, flowing robe? Each bend and curve of this sculpture was made by hammering thin copper sheets into a finished three-dimensional FORM (repoussé). Does the photograph make you wonder what size shoe Liberty wears? Her feet are very large. 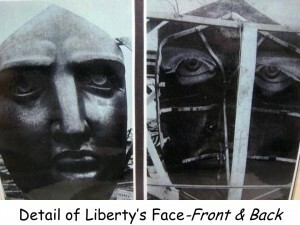 This is a photograph of the statue’s face as it was seen from the front (left) and from behind (right), before being completely assembled. Can you see the metal supports attached inside the copper “skin” of Liberty’s face? This is a front page copy of Joseph Pulitzer’s New York newspaper, dated August 11, 1885, announcing that Liberty’s pedestal fund had not only reached its goal of one hundred thousand dollars the day before, but had exceeded it by $2,000! 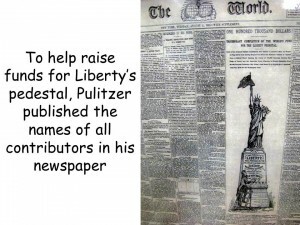 To boost the circulation of his newly acquired newspaper, The World, Joseph Pulitzer announced a campaign to bolster the lagging pedestal fund. 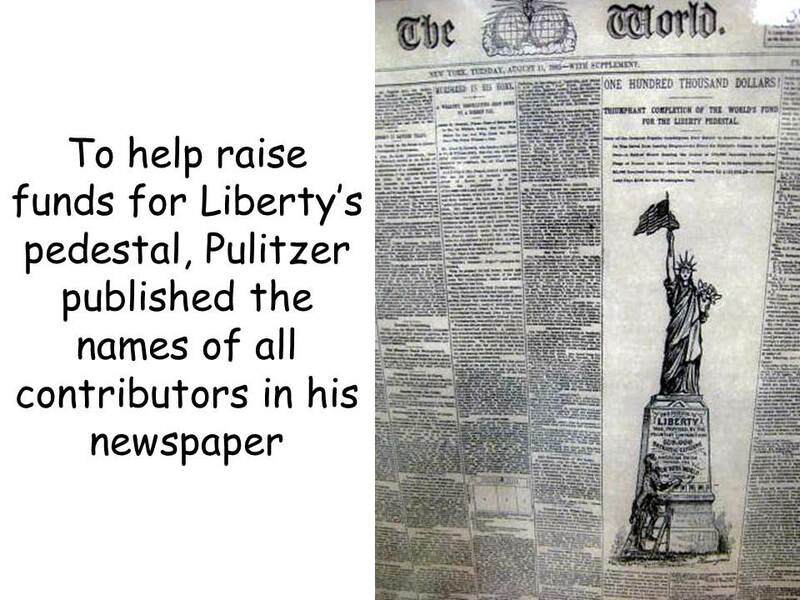 Pulitzer, a Hungarian immigrant, promised to print the names of all donors to the pedestal fund in the columns of his newspaper. His relentless editorializing added more than $100,000 to the fund while doubling and then redoubling his newspaper’s readership. By early August of 1885, The World could take front-page credit for the “triumphant completion” of the pedestal fund—and for the largest newspaper circulation in the Western Hemisphere. For two solid months, the ceaseless reminders, editorials and long lists of donor names published in The World, along with theatrical and sports benefits, all kept the issue of money for the pedestal alive. A good part of the total amount collected was contributed in amounts of $1.00 or less. The impact of accumulated small gifts from poor and middle class Americans achieved in a few weeks what years of fundraising from wealthy Americans had failed to accomplish. One boat in the harbor was full of protestors. Today it seems incredible, but no women were invited to Liberty’s unveiling except for the wives of the French officials. A group of suffragists campaigning for women’s rights positioned their boat directly in front of the viewing stand. These women wanted to point out the irony that a statue dedicated to the idea of liberty was in the form of a woman at a time when women were denied even the basic right to vote in America—a right women finally won in 1920—thirty-four years after The Statue of Liberty was dedicated. The U.S. government began keeping records on immigration in 1820. Ten years later, records indicated that roughly a half-million of the 13 million people in the United States were foreign-born. From that point and for the next century, the flood of humanity that washed onto America’s shores was truly overwhelming. Between 1880 and 1920, 23 million immigrants arrived in the United States. They came mainly from the countries of Europe, especially from impoverished towns and villages in southern and Eastern Europe. The one thing they had in common was a passionate belief that in America, life would be better. Most of these immigrants were poor. Somehow, they managed to scrape together enough money to pay for the passage to America in steerage, deep in the hold of a steamship, occupied by passengers paying the lowest fare. Many immigrant families arrived penniless. A steerage ticket to New York cost $10 – $15. Very often, the trip cost too much for an entire family to go at once, so the father went first and when he earned enough in America, he sent for the rest of the family. “My first impressions of the New World will always remain etched in my memory, particularly that hazy October morning when I first saw Ellis Island. The steamer Florida, fourteen days out of Naples, filled to capacity with 1600 natives of Italy, had weathered one of the worst storms in our captain’s memory; and glad we were, both children and grown-ups, to leave the open sea and come at last through the Narrows into the Bay. My mother, my stepfather, my brother Giuseppe, and my two sisters, Liberta and Helvetia, all of us together, happy that we had come through the storm safely, clustered on the foredeck for feat of separation and looked with wonder on this miraculous land of our dreams. To accommodate this immigration process, the U. S. government established Ellis Island as a clearinghouse, to establish whether immigrants should be allowed into the country. The island’s location was New York Harbor, which served as a moat that quarantined the incoming immigrants from the mainland of the United States. The island is about one mile south of Manhattan and was once used by early Dutch settlers as a picnic ground. When a fire destroyed the original immigration reception center, a new brick and limestone building was constructed, completed and opened on Ellis Island in 1892. On the day the new processing center opened, the first person to step ashore was Annie Moore. She was a fifteen-year-old girl from Ireland and had traveled with her two brothers to join their parents, who had settled in the United States three years earlier. The great registry hall processed as many as 5,000 immigrants each day before allowing them entry into the United States. When their ship docked at a Hudson River pier, the immigrants had numbered identity tags pinned to their clothing. Then, they were herded onto special ferryboats that carried them to Ellis Island. Officials hurried them along, shouting at them in half a dozen languages. Some immigrants were cleared within hours and left for the mainland of the United States, but many spent hours in the massive registry hall, waiting for physical exams and document checks. Many left the hall with new names when exasperated immigration officials were unable to spell the immigrants multisyllabic real names. Yet to most, the delays were acceptable when they were at last on the Ellis Island dock waiting for the ferry that would take them to their new home. Immigrants continued to flood onto American shores until a strict immigration law went into effect on July 1, 1927, severely restricting the number of immigrants that would be allowed into the United States. The island was closed as a processing center in 1954, but in 1965, it was declared a National Monument, joined with the Statue of Liberty National Monument, and is now a museum of immigration, annually visited by hundred of thousands of tourists. Ellis Island is one of New York City’s most popular tourist attractions today.